The cast of Indecent. Photo by Carol Rosegg, Courtesy Connecticut College. Postmodern choreographer David Dorfman grew up watching experimental theater, so it makes sense that elements like text, abstract set design and socially conscious through-lines pepper his work. Choreographing for theater seems like a natural next step. The opening of Indecent on April 18 marks Dorfman's first outing as a Broadway choreographer. The play is about the making of God of Vengeance, a 1923 Broadway production based on a landmark Yiddish play, and deals with homosexuality and freedom of expression. How did you get involved in Indecent? I've known Rebecca Taichman, one of the creators, for 13 years or so now. We did a project together called Green Violin in Philadelphia. What research went into choreographing this play? I did more research for this than I normally do. Some of it is a bit tongue-in-cheek. In order to do that you have to get in deep about the hand gestures and rhythms of Hasidic dance. I don't believe that we have to produce a totally authentic version. But you have to know exactly where something comes from in order to stray. What's been challenging for you? 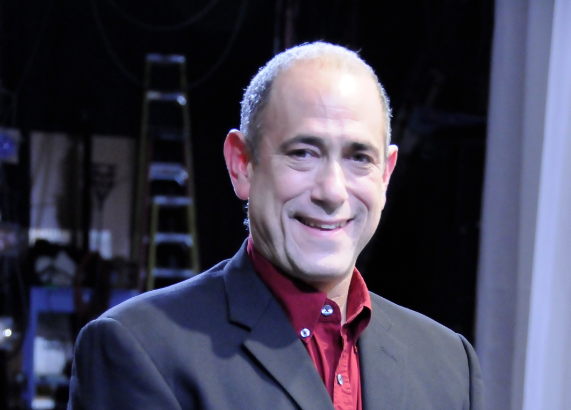 In addition to running his dance company, Dorfman is also the Chair of the Dance Department at Connecticut College. Photo courtesy Connecticut College. Will you take anything you learned to your choreography for dance? The humbling moment for me is learning that there are movements that might be legible and exciting in dance that just don't work for this play. It's about what is needed right now, right here, with these bodies in space. It's made me question what vocabulary is absolutely necessary in my own work. It can be a crutch to say, "Oh, this is a great turn or partnering move." How will people identify with the themes of this play today? This project is about love, different kinds of love, and being bold with your art and your life and censorship. It's a complicated examination of expression, and how we express ourselves to each other is such a delicate issue. How do you have hope for a future that's hopefully filled with love? Can we use love to drive something that we might have as much distrust in as politics? I think a lot of us are thinking that now. It's often theater that helps us see how we express humanity. The strife in this play speaks to love on so many levels.